We were originally told by Glen that Bois Joli (Monday's hike) would be the most difficult, but it turns out today's was longer and occasionally steeper. That said, most of us found today's hike to be easier because it was less rocky, often shady, and took us through gorgeous jungle and mountains. We walked narrow cow trails (as we call them in Texas) that wove up, around and through the mountains. Twenty-foot tall blooming orange century plants lined the first part of the mountain trail. We walked through rows of banana trees and by a small farm of tobacco. We spotted a red-headed woodpecker on top of a royal palm and picked up fossilized shells from the rocky parts of the trail. The landscape was lush and green, dotted with cows and chickens and small huts. The clinic was again in a converted school, and the folks who had been there before were excited that the roof was now aluminum and no longer thatched banana leaves. School children in uniforms came out to greet us. We set up the BP station outside, triage in the big school room, pharmacy in a smaller room, and the doctors in rooms that looked like stalls. It was frustrating to see so many patients who had once been treated for BP but had stopped taking their medications. It was sad to see people who were presenting with symptoms most likely caused by not having enough food. It was reassuring to see patients with high blood pressure come in with complaints like headache and dizziness, knowing that the pills we would prescribe that day would truly help them. I need to take a moment to showcase two members of our group: Reg and Earl. Dr. Reg Brooker is 76 and completes all these hikes without complaint (and sometimes near the lead). He has been to Haiti 50+ times. His first visit was in 1981 with John Page and Pierre Williams, the original builders of the water system. At that point, Cange wasn't even really a town. An oncologist in Greenville who attends Christ Church, he started working in Cange even before Paul Farmer got here and alongside of Paul when he was still a student. Dr. Brooker has also traveled all over the world, as an Army doctor, a volunteer, and for fun. His stories are amazing and his attitude and enthusiasm are inspiring. I advised him to write his memoirs; I hope he does. Earl Burch is like a king here. Everywhere we go around Cange, young people ask in broken French or English for Earl Burch. He personally (or combined with Summits Education) funds 15 or so young and university students to go to school, and he coordinates Holy Trinity's support of 12 university students (I need to check these numbers.) The kids know Earl is the point person to ask for help, so they constantly approach him for money, laptops, and his contact information. He takes it in stride, kindly talking to each one, taking meetings and hearing their pleas. He understands well how things work in Cange and has a long history of coming here. Every member of this group, and the kind folks translating and helping us, is valuable, interesting and caring. I feel blessed to be a part of this. The Clemson Tigers just won the 2018 College Football Championship. Yet again, our little town received a big spotlight and unexpectedly took down a football giant. It was certainly fun, but this year felt even more personal. That's because in November, D. and I had the chance to spend a game weekend embedded with the team. D. was invited as guest professor as part of the impressive PAW Journey program within the Clemson Football program. 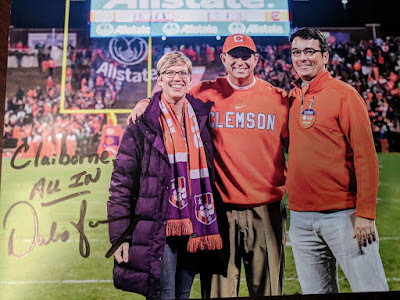 For every game, the team invites a professor and his/her guest to spend the weekend with the team, from Friday's departure to the end of Saturday's game. The idea is to show a professor what their students' experiences are like, as well as show the players that academics are an integral part of the program. D. has now or has had 16 players in his classes, so he was honored to be asked to go through a game-day weekend with them. Today was the day for packing up, mentally decompressing, and making connections with important people. We drove from Cange for about 45 minutes to Corporant, to the campus of CFFL (Centre de Formation Fritz Lafontante). Gillane Williams, a native Australian and current Greenville resident who spends much of the year in Haiti, gave us a tour. CFFL was developed as a trade school to teach three disciplines: agriculture, woodworking, and construction. The focus now is mainly on agriculture, as the other two disciplines closed because the students couldn't find enough jobs after graduation, and also because teaching farming techniques is the school's most important mission. The school opened in 2010 with major funding from the Upper SC Diocese, Zanmi Lasante/Zanmi Agricol, and Rotary Greenville.